Scribbling With Spirit: Window Sketches for When You Have No Time! Sometimes scribbling means just that--super quick marks made, splashes of color put down. I don't have a lot of time some days to think up an idea about what to sketch or to mix up the right color of paint or even to spend a whole lot of time really looking at my subject. I want to have one of those slower, more meditative drawing sessions, because I know how much better it will make me feel, and how much more it will make me appreciate my life. But in all honestly, I have a lot of other things to do and some days I have only got about five minutes. At best. I still try to manage to scribble something every day. And one thing that is always there at my house, at least as long as it is day time, is the view out doors. I am lucky. I live in the woods. But even if you don't, if you have a window, you have some sort of view and odds are it changes from day to day. Thanks to the light, the weather, the seasons, your neighbors, an intruding bird--if you take a look, you'll probably see something different. And even if you don't, what the heck. You change every day! So even if you draw the same thing--the exact same thing--the drawing will be different because you are. 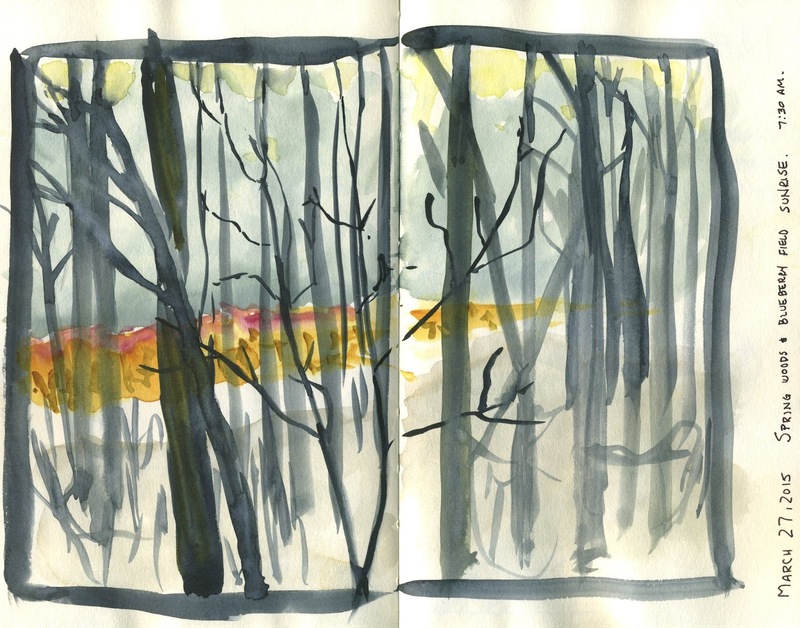 Here are two examples of quick scribbly sketches I did looking out the window in the last month or so. This first one took about five minutes total. As you can tell, I used a thin pen (Univision fine, black ink--very permanent and a very cheap pen!). I spent probably four of those minutes getting a little bit of detail into the tree shapes. But then I whipped out my waterbrush and put down some colors to approximate the sunrise. Here's the thing about this funny little drawing. It doesn't really look like the sunrise light through the woods that I see every morning. But it evokes it. 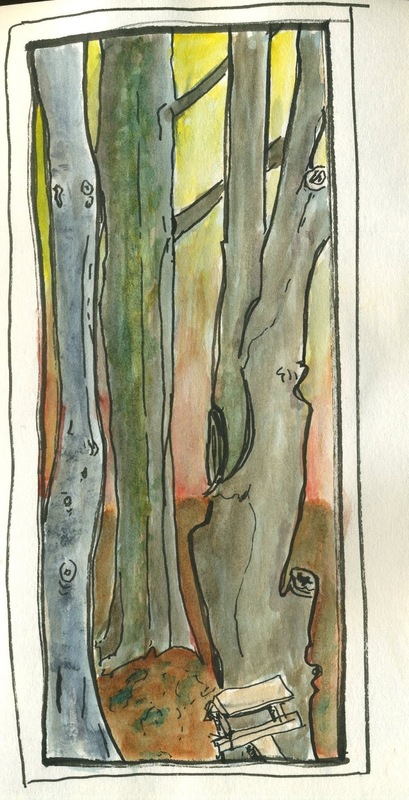 When I look at this drawing, I know exactly which trees those are. And I know exactly what that sunrise light looks like. So this silly little scribble has the power to make me remember. Totally worth the five minutes I put into it. This second sketch is completely different, though it took about the same five minutes. As you can see, it is a double page spread in a sketchbook. I did it all with brush from the start--no ink work at all. The trees are loosely based on the actual shapes in my yard, but I do not look at this and know which trees are which, like I do in the first sketch. Here, my intent was to capture the sense of seeing the blueberry bushes, which are red in the winter, through my leafless trees. They are the only splash of color in the gray wooded world between the snow melt and the coming of the green. Here they are a bit yellow as they picked up tint from the sunrise. This scribble takes me immediately to a scene I look at every day, every late winter, year after year. It even brings with the associations of the deer and turkey and coyotes I've seen and heard there. Absolutely worth the five minutes, even if it isn't much of a piece of "art." That is the joy of scribbling with spirit--one that undergirds all the pictures I make, even the one where I take a lot of time to try to create a lovely picture. But really, the loveliness of any sketch is, for me, just a bonus. The point is to capture a piece of my life that is important to me. So I notice it more in the moment, and can notice it more again and again in the future. And isn't it amazing--and wonderful--that I (and you!) can do this in as little as a few minutes?